"We are so sad to hear the news about Margaret. She was a..."
"What an impressive woman She was such a strong leader for..."
"We met you when we moved to La Center in 1968, Margaret. ..."
"Margaret was an amazing lady whom I admired so much. 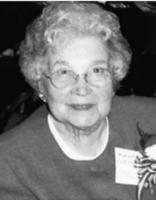 Her..."
Historian, philanthropist and regional treasure Margaret Colf Hepola of Woodland, WA, died peacefully Dec. 6, 2014, at her Etna Road home. She was 97. Margaret Leona Haller was born on May 27, 1917, near Woodland, WA. She lived her entire life within 5 miles of her birthplace. Margaret is survived by her children: daughters, Sharon (Bill) Giberson, Nancy Colf and Mary (Dan) Hayden, all of Woodland, sons, Richard Colf of Woodland and Robert (Linda) Colf of La Center, and step-son, Larry Hepola of Virginia. She is also survived by nine grandchildren, Clayton (Jessie) Giberson of Portland, Forrest (Wendy) Giberson of Seattle, Annalise (Matt) Galbraith of Portland, Desery (Betheny) Hayden of Ridgefield, Benjamin (Ashley) Hayden of Woodland, Molly Hayden of San Francisco, and Halle Colf, Garrett Colf and Dylan Colf, all of La Center; step-granddaughters, Angela Hepola and Tina Hepola, both of Virginia; step-grandsons, Jeff Gaudet of Colorado and Steve Hepola of Portland; great-granddaughter, Clio Marquez Giberson of Portland; and step-great-granddaughters, Avari Harrison and Eden Harrison, both of Ridgefield. Margaret Colf Hepola was preceded in death by her husband of 21 years, Walter E. Colf in 1962; Edwin Hepola, husband of 13 years in 1977; brothers, Mel Haller in 2012 Bob Haller in 1981 and infant Albert Haller in 1915; and sister, AnnaBelle Bauman in 2014. Graveside services will be held Wed., Dec. 10, 1 p.m. at Hayes Cemetery which is located about three miles east of Woodland on Hayes Road in Clark County. A Celebration of Life will take place Fri., Dec. 12, 11 a.m., at First Church of God, 3300 NE 78th St., Vancouver, WA 98665. A reception will be held following the Celebration of Life at Summit Grove Lodge, 30810 NE Timmen Rd., Ridgefield. Donations in Margaret's memory may be made to the North Clark Historical Museum, P.O. Box 296, Amboy, WA 98601; the La Center Historical Museum, 33920 NW Pacific Hwy, La Center, WA 98629; the Woodland Historical Museum Society, 417 Park St., Woodland, WA 98674; the Clark County Historical Museum, 1511 Main St., Vancouver, WA 98660; and the Cowlitz County Historical Museum, 405 Allen St., Kelso, WA 98626. Layne's Funeral Home, Battle Ground, is in charge of arrangements.